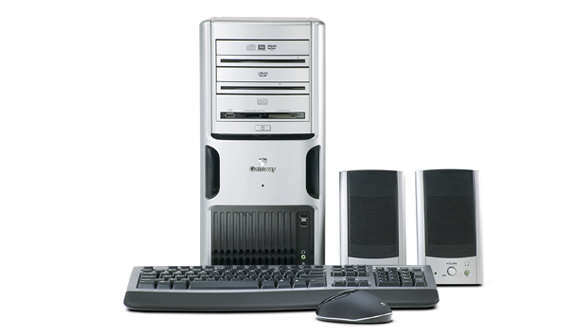 Gateway FX510 PC Series is budget yet high performing PC model equipped with brilliant graphics. Gateway FX510 Series includes FX510S, FX510X and FX510XL, and features Intel Pentium Extreme Edition Dual Core 955 processor, 7.1 audio supports upgradable to Creative Sound Blaster X-Fi audio card, landscape and portrait mode enabled high definition LCD monitor, PC5300 Dual-Channel DDR2 667MHz SDRAM, Serial ATA II/300 with Raid 0 support, Intel Viiv technology, Double-Layer Multi-Format DVD Writer (DVD±/R±RW/CD-R/RW) and 16x/48x DVD-ROM drive and runs on Microsoft Windows XP Media Center Edition, all housed in an advanced 7-bay, quiet and cool BTX chassis. Sci-Tech Today reviews Gateway FX510 series desktop computer and concludes with rating of 4.5 out of 5 that the Gateway FX510 series offers power and performance at a reasonable price. This highest of these high-end models will not appeal to everyone, but the tremendous memory, storage, and video-technology options will make discriminating power users sit up and take notice. And if you need fewer toys to play with, chances are Gateway has a configuration that will appeal to you.